The Used Department at B&H Photo's NYC Superstore is larger than most camera stores, and much of the used gear we have in stock isn't even on display. We have what must be the most eclectic assortment of used classics, limited edition, and special purpose cameras you're likely to find in one location. But since many of our best, long-time customers live too far to ever stop by and say 'Hi', we thought we'd write about some of the more interesting items we had on hand at the time of this writing. This particular lens is in extremely clean condition, and along with the original aluminum case that came with the lens, the original owner had a second outer case with wheels designed to go along with it. And remember; lift with your knees so you hurt yourself… know what I mean? The Tele Rolleiflex Type 1 ($1649) dates back to the early 60's, and along with it's wide-angle sibling, the Rolleiwide, was designed for Rollei fans seeking an alternative to the 75 and 80 mm 'normal' lenses found on standard Rolleis. The Tele Rolleiflex Type 1 features a 135/4 Zeiss Sonnar taking lens (and a 135/4 Heidosmat taking lens) that focuses down to 8.5', which while not close enough for tight head shots, still enables portraiture with a more compressed (and flattering) perspective as compared to a normal lens. 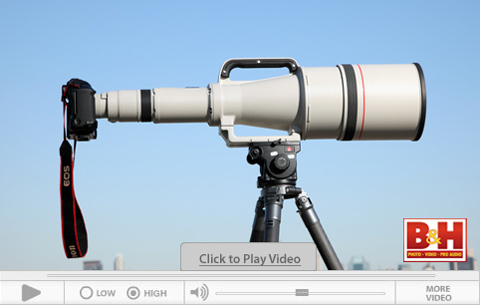 (If you need to get tighter you can add a Rolleinar 0.35x, which allows focusing down to 4.5'). This camera, which only shoots 120 film (the Type 2 shoots 120 or 220), has a grid screen, and a built-in meter, which once you figure out how 'off' it is, will deliver usable exposures under average lighting conditions. The overall condition of this Tele Rollei can be described as extremely nice. Looking for a lens that can capture everything in sight? Nikon's 7.5/5.6 Fisheye Nikkor ($1499, 1966~70) is designed to produce circular (23 mm diameter) images that capture a 180° angle-of-view. One of the earliest Nikkor Fisheyes, this lens requires the mirror be locked up and out of the way to allow clearance for the lens' deep-reaching rear element. Because you can't screw filters onto the lenses fishbowl-like front element, a set of 6 built-in, turret-style filters (L1A UV, Yellow 48 & 52, Orange 57, Red R60, and Lt Green XO) can be dialed into position as needed. 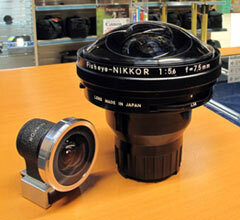 Included with the lens is an optical finder that slips onto the camera's hot-shoe for image composition. There's also a thoughtfully designed (and very convenient) hot-shoe slot on the lenses rear lens cap where you can park the finder when not in use. Note- This lens works with Nikon film cameras that feature a mirror lock mechanism and cannot be used with any of Nikon's current digital SLRs. For photographing buildings or other subject matter requiring rise and fall movements on a compact medium-format platform we have a Sylvestri 'H' Hermes 6x9 kit ($2699) in the house that might be worth considering. Bundled with a multicoated Schneider 47/5.6 Super Angulon lens and matching finder, the Sylvestri H is ideal for travel due to its compact-yet-precise, no- nonsense design. Weighing in at 2.82 lb and standing 8.7" tall, the Sylvestri H enables up to 15mm of rise and 10mm of fall, and accepts 120 and 220 Graflok film backs (6x4.5 through 6x9) including Mamiya RB and RZ 67 film along with 6x9 backs made for Horseman, Graflex, and Wista cameras. The Sylvestri H can be used tripod-mounted or hand-held when necessary, and bubble levels - vertical and horizontal - are available for squaring the camera to the subject. Oh yes, the Sylvestri Hermes kit can be adapted for digital capture. For most of its 30 year production life the Rollei35 was considered the cat's meow when it came to quality 35mm cameras that a: fit in your pocket, and b: took great photographs and c: had a German lens and cost less than a Leica. And it does in deed take great photographs to this day. The Rollei 35 has a fixed 40/3.5 Carl Zeiss Tessar lens that collapses into the body when not in use. Though not the fastest 'normal' lens in the field, it's certainly one of the sharpest. It's also the same design formula used in the 40-to-45mm 'pancake' lenses made by Nikon, Pentax, and others over the years. Because of the camera's small size the designers had to forgo a coupled rangefinder system, so focus has to be performed manually using the distance scale engraved into the lens barrel. Another casualty of the small body-size was a top-mounted hot-shoe. The Designers had to settle for a bottom-mounted hot-shoe to facilitate use of a flash, awkward as that seems. Meter readings can be taken using the camera's selenium cell meter, which unlike the camera doesn't need a battery (the Rollei 35 requires a PX-13 style replacement battery). This particular camera came with the original box, original cap, original wrist strap, and a genuine roll of Kodak MAX 135-24 that expired in August 2000. The film's useless, but you have to admit the bright yellow box really sings against the red velvet lining when you open the box. And like I said we have much more in-house than I can harp on here, so if you're looking for something in particular visit our Used Department in the store or on the web.